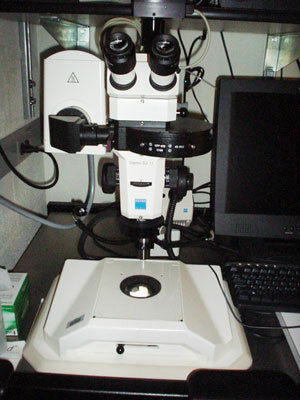 The STEMI is a stereo dissection microscope used for applications ranging from macro to micro imaging in transmitted, darkfield or epifluorescent modes. For examples of the fluorescent images collected on the scope click here. For other example images click here. If you want to look at fluorescence, turn on the mercury lamp located on the shelf to the left. Make sure that the lamp and safety lights are steady green before proceeding. Turn on the computer and the monitor if they arent already on. To do this, turn on power strip #1, and then turn on the computer and the monitor. For color imaging, turn on the CRI filter located on the shelf. Turn on the digital camera by rocking the power switch to the left (1394PWR). The light will be green. Log into the computer using the User account. *Be sure that each time you change the magnification you take a picture of a standard size, such as a the ruler or scale slide that we have provided. *click here and see what will happen when you try to make a figure for publication if you don't follow these instructions. 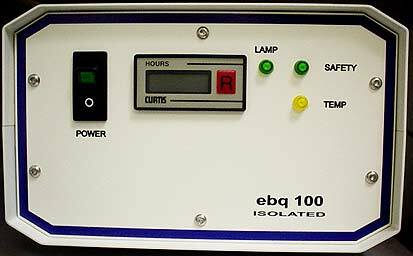 There are two different light sources with power supplies labeled top and bottom. The bottom light source is for transmitted light. Transmitted light means that the sample is illuminated from underneath and the light goes through the sample. The top light source will reflect light off of the sample. You may use both the top and bottom light sources simultaneously for more complex lighting. Initially set brightness at ~3.5, afterwards you may adjust the brightness as needed. The Top light source should be set the light in the blue region [You must depress and rotate the knob to get to the blue region]. Unscrew ring connecting fiber optic cable to source. Gently remove fiber optic of unwanted source (ring or point source). Make sure the fluorescence turret is set to 4 (NO FILTER). Make sure the CRI filter is pushed in. Slider should be pushed in for RGB color imaging such as brightfield histology. Slider should be pulled out for fluorescence or b/w imaging. Place sample on the stage. Note: Please be careful not to scratch the glass surface. Set the magnification using the knob on the right side of the microscope to the highest zoom, 6.6. Focus the sample using coarse (large-"inner") and fine (small-"outer") knobs. Focus the right eyepiece on the crosshairs by rotating the rubberized rim, and re-focus your sample with that eyepiece. Next, focus the left eyepiece so that the image is sharp. The dial below the eyepieces adjusts the depth of focus. We recommend you leave it set to the middle position. You may adjust the zoom. 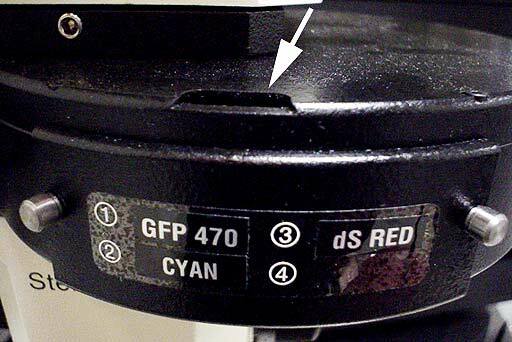 For color imaging, make sure CRI filter is inserted. Send light to the camera by pushing beam splitter in. Slider pulled out to see with both eyes through the occulars. Slider pushed in to send light to camera. To preview the image in B/W, press F3. For color preview, press F7 and change binning to 2x2. Place the cursor on the brightest spot on the image, you can find the pixel intensity value at the bottom left. Adjust exposure time so that the maximum value of the brightest spot is about 200. Press <SHIFT>F8 to capture an image. For 2x2 binning, enter the exposure time from the previous step. For 1x1 binning, multiply the exposure estimated by 4. Press F8 to take a picture. File --> Save All Files and put the pictures in a folder with the experiment name or, for each picture, File --> Save As. Make sure all files are saved as TIFF. 2. If you really need it, turn on it FIRST before the other equipment. The camera must be off when you turn this lamp on!! The arrow points to a small window where you can read the position of the filter turret. Pull out the CRI filter from the light path one stop (for B&W imaging). Open fluorescence shutter by pushing in the slider one stop for no filter, or two stops for Neutral Density filter. Turn off fluorescence by pulling slider out. Push slider in to open fluorescent shutter. Use the F3 key to run a live focus (<SHIFT>F10 may be used to preset the box size and exposure time). On the live focus window, find what you want to image and focus the image. Use the <SHIFT>F11 command to set the exposure times and binning for the QuickSnap function keys F9, F10, F11 and F12. For 1x1 binning, multiply the estimated exposure time by 4. Then press F9, F10, F11 or F12 to snap a picture. We do not recommend usig the snapshot button in the camera menu! Bring the live focus window to the front and continue imaging. All exposure times are in milliseconds. For the unitly challenged: 1000ms = 1s. Click on the Acquire Preview control window to change time, size, etc. while focusing. Click on the image window to use other function keys while focusing. This is a checklist; please follow it step by step. 1. USB flash memory key. Log out of your computer account. If the next user is not present, turn off the camera unit. Turn off the light source and power strip at the left. Check the signup sheet in the hallway. Please dispose of waste appropriately and remember to take your sample with you. Sign out of the logbook.